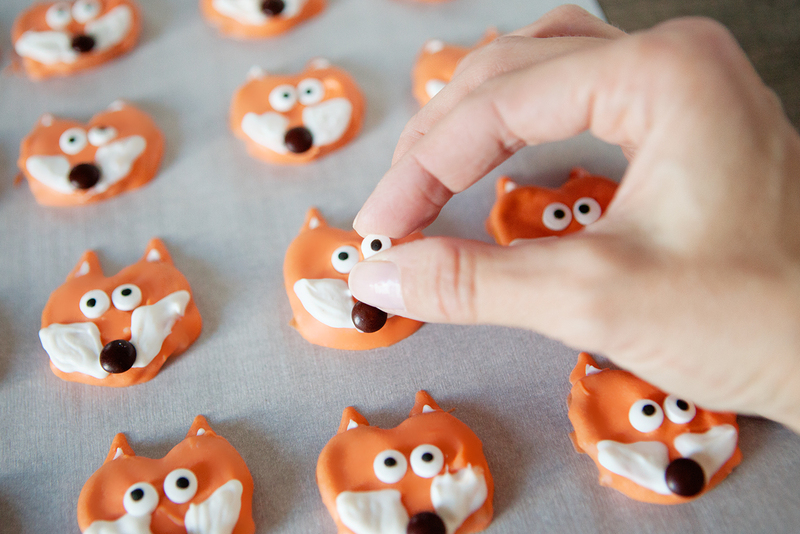 The cutest little chocolate covered fox pretzels. 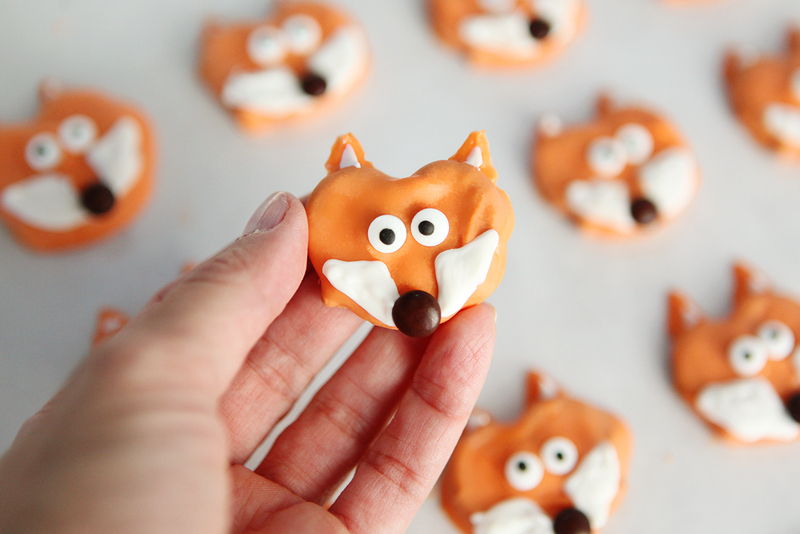 A delicious fall treat that can be made in just a few minutes! 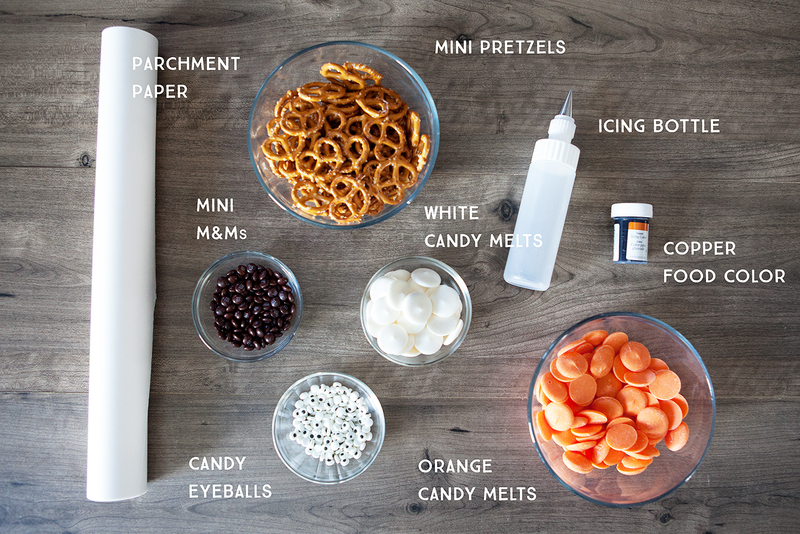 Chocolate covered pretzels are one of our favorite quick and easy treats to make for any season. These pumpkin pretzels we made for Halloween were a hit and we’ll definitely be making these reindeer pretzels again this Christmas! Melt orange chocolate candy melts in a microwave safe bowl. Heat in 30 second intervals, stirring well in between until chocolate is completely melted. 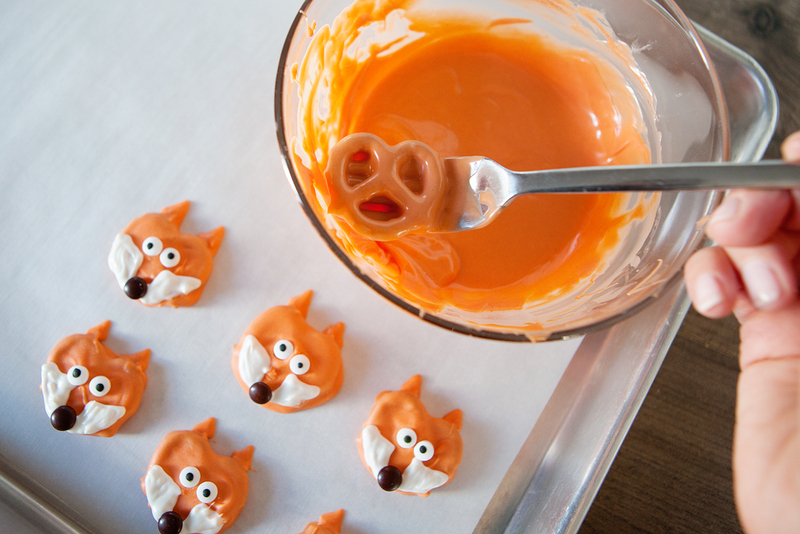 Once melted, add a small amount of Wilton Copper Icing Color to the chocolate to give it a more burnt orange color. Dip pretzels in chocolate, covering generously. Place on cookie sheet lined with parchment paper. Fill in entire pretzel with melted chocolate. Melt white chocolate candy wafers according to directions above. 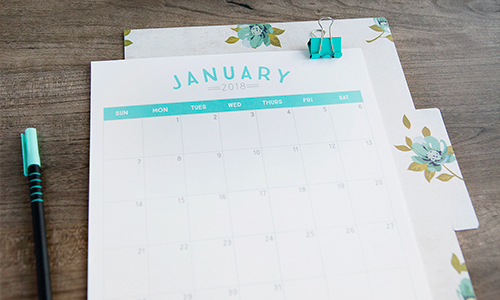 Place in a fine tip icing bottle. 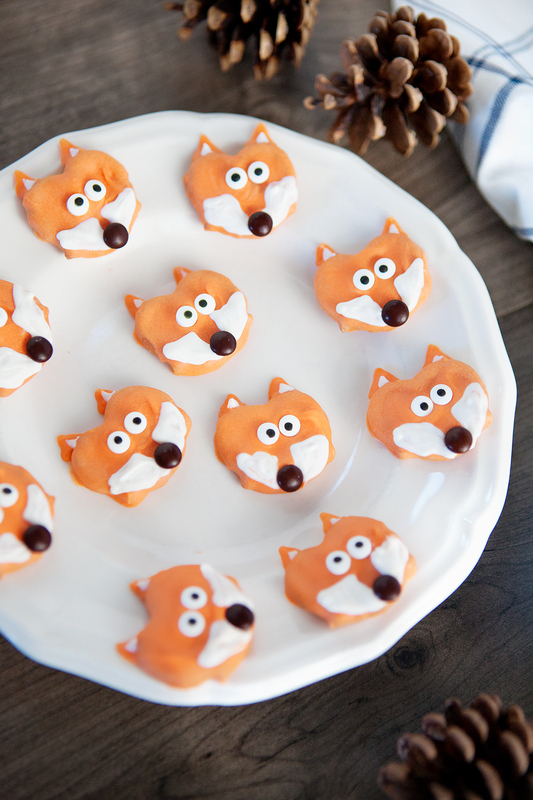 Pipe white icing to cover white areas for the fox’s face as pictured. 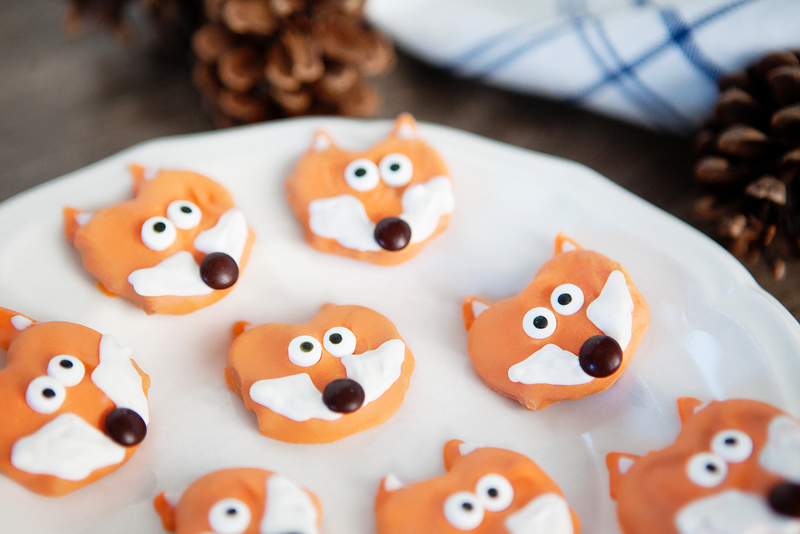 Place some of the melted orange chocolate in an icing bottle and add ears to the top of each pretzel. Add eyeballs and brown mini M&Ms while chocolate is still warm. Use a toothpick to add a small triangle of melted white chocolate to each ear. Place in refrigerator to cool. Remove when chocolate is completely hardened and they’re ready to eat! 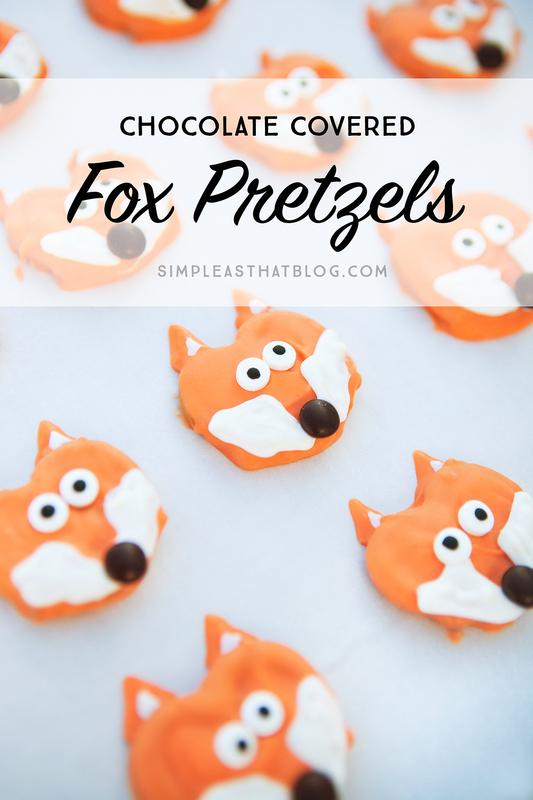 This batch of chocolate covered fox pretzels disappeared quickly at our house and my kiddos are already asking what our next chocolate covered pretzel creation is going to be!